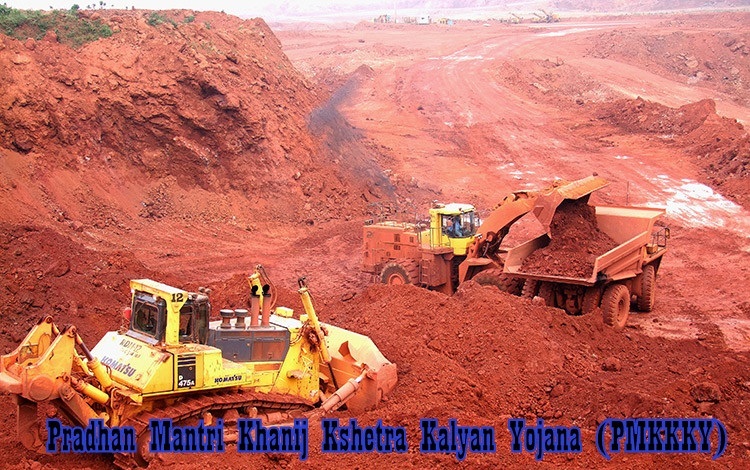 The Government of India has launched Pradhan Mantri Khanij Kshetra Kalyan Yojana (PMKKKY) on 17th, September, 2015 for the welfare of affected people in mining zones or areas. This scheme was launched by Minister of Mines and Steel Shri Narendra Singh Tomar, calling it a revolutionary and unprecedented scheme.for the welfare of the people. Under the Mines and Minerals Amendment Act 2015, District Mineral Foundation (DMF) will be set up in the affected districts or areas due to mining operations. DMF will implement the Center and State sponsored schemes in these districts. The DMF shall prepare and maintain an updated list of such directly and indirectly affected areas by mining related operations. Center Government has also notified that royalty will be given by the miners to DMF which will be used as fund for the welfare of the affected people. In case of all mining leases executed before 12th January, 2015 (the date of coming into force of the Amendment Act) miners will have to contribute an amount equal to 30% of the royalty and, where mining leases are granted after 12.01.2015, the rate of contribution will be 10% of the royalty payable by them to the DMFs. - The DMF will ensure the implementation of development and welfare schemes in mining affected areas; mitigate the adverse impacts, during and after mining projects on environment, health and socio-economic conditions of people; and ensure long-term sustainable livelihoods of affected people. Proper water treatment and supply of drinking water in the affected zones. Environment and Pollution control measures. Health care and special welfare for women, children, old aged and disabled people. Center and State run Education and Skill development will be implemented. Proper Sanitation and Households will be provided. Develop Physical infrastructure- Railways, roads, bridges etc. Provide Irrigation system and development of renewable energy sources and rain-water harvesting system. Development of Orchards, integrated farming, restoration of catchments. This will be a vital schemes for the scheduled areas and for the affected people due to mining areas. It will provide better living environment and conditions to the affected people who are deprived of their basic rights. DMF will work with utmost transparency and external audit will be done every year whose report will be placed in public domain and it will also come under RTI act, 2005. DMF implement projects in affected village, approval of Gram Sabha shall be required. And, will identified the affected people with consultation of local/representative of Gram Sabha.Moreover, Report on the works undertaken under PMKKKY in the respective village shall be furnished to the Gram Sabha after completion of every financial year. Complete List of tours by PM Narendra Modi in 2014-2015. Comments "Government of India launched a welfare scheme for People in Mining Zone"